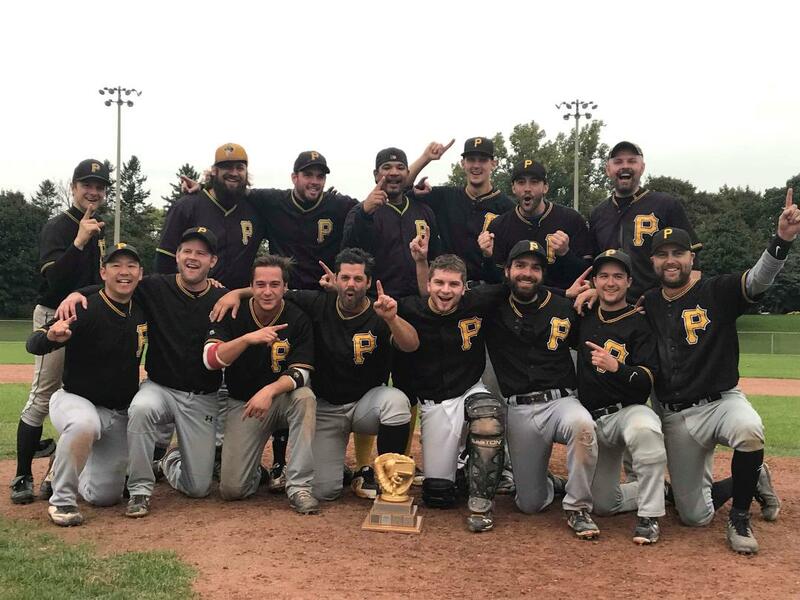 Pirates win their first SABL Championship. The Pirates found themselves in a dire situation: being no-hit, going into the top of the 5th inning of a scoreless elimination game against the SABL's best team. Manager Pat McEnroe tried to rally his team's offense, "Guys this is it, we've got to get something going right now!" A few moments later, a plastic Winners bag blew its way into the dugout. "Let it do what it needs to do." The Pirates' season was many things, but predictable was not one of them. Over the course of the team's history, the Pirates had found uneven success during their time in the SABL. Beginning with an abysmal 4-27 record during their inaugural season of 2013, to a franchise best .613 win% in 2017, the team continued to show improvement but was never able to advance past the first round of the playoffs. So, with a strong core and some key acquisitions, the club's optimism rose to an all-time high coming into 2018. "At the indoor facility back in March", said new addition Morgan Lovsin, "I told Pat in the parking lot, I think we got a real shot at a championship this season." The year began like most, but unlike any other in Pirates' history, the team now had depth at every position and outstanding defense soon became the norm. In the infield, Shane Wray held down the hot corner while Pat McEnroe handled first base. Chris Tzogas and Morgan Lovsin paired with Spencer Fox up the middle, and Mike McIntosh, Mike Pohlod, and Jamie Lennox ran down balls in the outfield. Behind the plate were Ben Chisholm and JD O'Leary. O'Leary stopped opposing runners, while Chisholm provided leadership and acted as the de facto pitching coach. Daniel "The Kid" Halat added his game calling talent behind the dish to round out perhaps the deepest catching corps in the league. Yet the team's primary strength continued to remain on the mound. The staff was anchored by its always-reliable ace, John Schade. Danny Wesley, who managed a nagging shoulder injury to great effect, was the team's number two starter; and driven by a sense of unfinished business, Chris LePan returned to complete the rotation. Finally, at the back of the bullpen, Jamie Lennox established himself as a bona fide closer. However, as the season wore on the team's faith in themselves would be tested; in particular, the Pirates managed to score just 99 runs during the regular season, the lowest in the league. "I expected it to be better", admitted veteran hitter Patrick Chan, "We added some key pieces, but otherwise brought back substantially the same cast." Because of their struggling offense, the Pirates set a modern SABL record with seven ties on their way to a sub-.500 finish in the standings. But there were always glimpses of what could be: shut-down pitching and highlight-worthy defense that was best in the league at run prevention. If only their bats would come around. The first round of the playoffs saw the Pirates match up against the third-seed Giants, who were coming off their best season to date. In Game 1, the Pirate bats instantly sprang to life, scoring early and often, amassing nine runs in the first two innings alone. This outburst matched their highest single-game run total of the entire regular season. On the rubber, John Schade was as automatic as he'd ever been, allowing only five baserunners over 7-innings. Late in Game 2, leadoff man Morgan Lovsin, who collected two of the Pirates' four hits, stole both second and third base on his way to scoring the game-winning run. In the bottom of the 7th inning of Game 3, with the Pirates looking for a sweep, the Giants had the tying run at the plate for the heart of their order. When the runner on first attempted to steal, catcher JD O'Leary gunned him down to snuff out the rally and propel the Pirates to their first playoff series victory. "As we ran onto the field to celebrate, I knew that we had a real chance at getting on a roll, and now we had the confidence", said O'Leary. After the 10-run outpouring in their first game versus the Giants, the Pirates' lineup only managed to score five total runs in games two and three combined. Given their regular season track record, they would need to show that it was no fluke as they headed into the Semi-Finals against the league's top offense and also its defending champions, the Royals. During Game 1, the Pirates proved just that by jumping on the Royals to the tune of six first-inning runs. Chris Tzogas chipped in with 3-hits on the day to back-up a John Schade shutout. "It felt like the Baseball Gods were finally helping us", said Ben Chisolm, "we were starting to get the bounces." In the second and third games of the series, the Royals showed exactly why they are among the league's toughest teams as they rallied from 3-0 deficits, twice, on their way to winning both contests. With their run production halting early in both games, Jamie Lennox noted, "We only need to score five runs. When we score at least five runs, we win." This became the Pirates' new objective. Down two games to one in a best-of-five series, heading into what could possibly be the final day of a season that began back in February. The Pirates, with their ace on the hill, remained relatively unfazed by the challenge that lay ahead. The game remained scoreless, and the Pirates hitless, through four innings. That is until a rally bag drifted its way into the dugout. With two outs, the Pirate batters rattled off five straight hits--their only hits of the game--to produce the five sought-after runs. This outpouring proved more than enough support for John Schade to secure his second shutout of the series, and keep the Pirates' playoff hopes alive. "I knew if we could just keep the score close", said Schade, "anything can happen in the SABL when the games are close." As he warmed up in the bullpen prior to Game 5, Danny Wesley stopped, grabbed his aching right shoulder, and motioned for McEnroe and Chisholm. "I don't know if I can go", said Wesley. McEnroe and Chisholm looked at each other. "It's your body, and I can't tell you what to do, but we need you right here", replied McEnroe. Wesley nodded "I'll try", as he went on to pitch around a couple of Royals' singles in the bottom of the first. In the top of the second, Ben Chisholm drove in the game's first run on a base hit, when a rallying cry went out "Let's turn Pat Chan into a run!" Chan delivered with an RBI single of his own, and by the end of the inning the Pirates had sent 11 men to the plate and scratched together six runs. On defense, Spencer Fox seemed to appear wherever the Royals hit the ball. "When you're playing a series, it gives you the opportunity to learn a hitter's tendencies" said Fox, "you can better position yourself in relation to where he might hit it". With two outs in the bottom of the 7th, he ranged up the middle to pull-off a spin-o-rama behind second base to record the final out of the game, and send the Pirates to the SABL Finals. Going into the Finals, the Pirates' confidence was now reinvigorated by an energized offense. "I felt we were the team of destiny", said John Schade. There, they squared off against a Mets team who was also making their first SABL Finals appearance as the league's second ranked team. Early in Game 1, the Mets jumped out to a lead, but the Pirates fought back thanks to rookie Daniel Halat who ripped a single and used his speed to get his team on the board. The Pirates then went on to get production from up and down their lineup, highlighted by Mike Pohlod's 3-for-3 performance. However, the Mets would not go quietly. Although the Pirates would go on to win that game, the Mets would convert the momentum of their 7th inning rally into a Game 2 victory. From the outset of the series, Game 3 appeared to be a major turning point. Whoever could take this game would have a clear upper-hand leading into the final doubleheader of the year. The Pirates drew first-blood, with the quartet of Lovsin-Tzogas-Lennox-McEnroe creating three first-inning runs. The Pirates then turned to their number three starter Chris LePan, for what would be the most important game of his SABL career. "I felt nervous but determined. I thought about going in aggressive, throwing every pitch with conviction. I knew it would be a long and disappointing offseason if I pitched scared or too carefully" said LePan, as he kept the Mets in-check over four innings before exiting with the lead. In the bottom of the 7th, after a pair of two out walks, the Mets began to rally as the top of their lineup came to bat. The next hitter then drilled a line drive into center field. Mike McIntosh, racing in, made an all-out diving catch to end the game. "At the moment the play happened, everything slowed down; it felt like I was already running before the pitch, and as soon as he hit it, I knew I was going to get it. I wasn't going to let anything drop", said McIntosh. Coming into the final day of September, the Pirates had no misconceptions that the Mets would make it easy for them. Despite needing only a single win to the clinch the championship, they prepared themselves to play the full 14-innings. Straight out of the gate, the Mets took a lead in Game 4. The Pirates began to methodically chip away, but the Mets would not fold as they tacked on two more runs in the 6th to clinch the 5-3 win and force a decisive Game 5. Earl Weaver once said that "momentum is only as good as your next starting pitcher." So as the Pirates sat calmly, idly chatting in the Wishing Well stands awaiting the final game of the season, their eyes turned to the bullpen wondering if Danny Wesley had anything left to give. "I knew that if Danny could give us 3-4 good innings, we would have a good shot at winning it", said Chris Tzogas. As they had done repeatedly over the past five weeks, the Pirates staked themselves to a first inning lead, but the Mets would counter immediately with a run of their own to make it 2-1. Shane Wray led off the top of the second with the first of his two doubles on the day. When a groundout moved him to third, he sat 90-feet away from giving the Pirates some much needed insurance. Just then, a breaking ball snuck past the Mets' catcher, and Wray dashed towards the plate. "I just reacted" recalled Wray, "it was all a blur." As he neared home after getting a late break, he slid, his foot barely slipping underneath the pitcher's tag as the umpire signaled 'safe'. This turned out to be the last run of the Pirates' season. In the bottom of the third, Wesley began to falter after a one out hit-batter. He then gave up a single, and plunked a second Mets hitter to load the bases. From first base McEnroe called time and headed towards the mound. With the season on the line, he attempted to pump-up and refocus his pitcher, "you've got this", "you're a terminator", "we're going to get a double play and get out of this!" A few pitches later resulted in a ground-ball to Fox, who stepped on second and threw to first: double-play. In the 6th, the Mets began to rally again. With one out and one run already in, a double-steal moved the tying and go-ahead runners into scoring position. The following batter lofted a fly ball into right field towards Morgan Lovsin. "It was hit high enough that I had time to get into a good position for a catch and throw," he said, "knowing how tight the game was, I just put everything I had into it." After both Mets tagged-up, the runner from third base retreated. However, unaware, the runner at second base proceeded to advance. As the throw came home, O'Leary quickly fired the ball over to Fox and the end result was another inning-ending double-play. "When I received the ball at the plate, I knew I had a chance to throw behind the runner", weighed O'Leary, "but I also risked throwing the ball into centerfield, ending our season." After barely escaping another jam, with their closer warmed, and the bottom half of their order due up, Pat McEnroe took a major gamble. With this being their last chance to score, he cut the lineup in an effort to reach the hitters who had continually delivered all postseason. But because they were a lower playoff seed, and thus not the home team in this final game, it meant that the Pirates would have to handicap one of their biggest assets in the bottom of the 7th , their defense. The gambit failed and the Pirates went down in order 1-2-3. "I understood the move, but all that said, I was excited, nervous, as I went into the outfield that inning", remembered Mike Pohlod. So the misaligned Pirates took the field clinging to a slim 1-run margin, as they sought three final outs from Jamie Lennox. "Going into the 7th I felt loose, my arm felt better than it did most games. It was probably due to the adrenaline of that situation." Lennox was able to retire both of the first two batters on pop-ups. "It was nail-biting" confessed Danny Wesley, "I was crouched down in the dugout praying for the third out." "It was like a big ball of emotions that exploded"
"I remember being in shock"
"It was a great feeling, I'm really proud of all the guys"
So who would have expected that any championship team could win the same number of games in the playoffs as they did in regular season? That is, who could have predicted that a 6th place team could have defeated the league's Top-3 to win-it-all in the end? "It was like a goddamned Walt Disney movie with coarse language and alcoholic refreshments", said Chris LePan. "We tried to pin our championship run to one thing we did really well, but the fact is we did everything really well in the playoffs. Superb pitching made it easy on our defense, and then some superb defense made it easy on our pitching", added Morgan Lovsin. And about the offense that struggled during the regular season? "We were able to beat the top teams and pitchers throughout the playoffs," explained Patrick Chan, "we pounced on them before they could get into a groove." Indeed they did, as the Pirates manufactured 17 first-inning runs during the playoffs. In total they scored 65 runs in their 13 playoff games, or rather, precisely five runs per game. "For my first year in the SABL, I knew from day one that this was a very determined group. We all believed that we were going to be a championship team." "Our chemistry and desire to play baseball is unbelievable; from midnight indoor workouts, to frozen outdoor practices, to draining a rain-soaked field before a doubleheader. These guys never stop working, never stop grinding, and they don't just do it for themselves, they do it for each other."